The wheelchair ramps are generally used to access a wheelchair accessible or converted vehicle, from both rear and side access and can meet the majority of wheelchair accessibility needs. 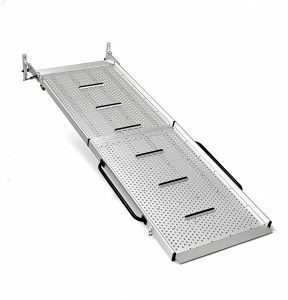 Passenger lifts ramps are primarily designed to provide quick and secure access to people in wheelchairs. Discover all our ramps for wheelchairs and for passenger lift services! Access-Ability's mission is to offer WAV professionals the necessary technical and commercial support so that our products become their commercial success. With its international team, Access Ability wants to become the reference supplier to European WAV convertors. For the wheelchair accessible vehicles, Access-Ability offers a range of innovative products to professionals, individuals and transport users.